Quick note: This post is really focused on sewn-slings. So we don’t go over on the pros/cons of tied 1″ webbing. Generally speaking, the best use for nylon slings is for anchors and the best use for Dyneema slings is alpine (extendable) draws (if you want to dive deeper into the pros and cons of sling materials, check out our sling materials post). If you follow those rules of thumb you’ll be limited to certain widths by the material. Since nylon has a much lower strength to weight ratio than Dyneema, nylon slings are not available under 1/2″ widths. And conversely, slings that include Dyneema (or Dynex/Spectra), won’t be found on slings over 5/8″. The skinnier the sling the easier it is to twist, bend, fold and manipulate. That said, a sling can be so skinny that big hands (or gloved hands) can have trouble grabbing hold. The perfect balance between flexibility and bulk is a personal decision and will differ depending on the intended use. Rule of thumb: alpine slings require more dexterity (less width) while anchors can be bulkier with minimal negative effect. It is also important to note that slings that include polyester instead of nylon are slightly stiffer than their nylon cousins as this will also affect the handling. This is another reason why we recommend handling different width slings in-store or on your friends rack before making a purchasing decision. Generally the less Dyneema, the cheaper it is. Pure nylon slings are the cheapest with nylon blends (more equal ratio of nylon and Dyneema) being a close second. Also generally speaking, the skinnier the sling the more expensive it is. If you’re looking to minimize price, the 16 mm width range will have the best deals since they’re almost exclusively made of nylon (or polyester, but nylon is currently cheaper), and this width has saturated the market so prices are low. For alpine slings, the best bang for your buck is the 12-14 mm (~1/2″) for hybrid Dyneema/nylon blends. This range still has nice handling characteristics and doesn’t have a large price jump from the strictly nylon offerings. And, the 9-11 mm (~7/16″) range for Dyneema slings is also a good spot if you’re looking to slightly bias weight over pricing. *Worth noting: While it seems that most single slings are considered 60 cm / 24″ there is some deviation in length options offered by the manufactures. Due to this variance, we label “single” slings lengths as 50 cm to 80 cm. This data was pulled in March 2016, and included widths and prices for 92 different single slings from 24 different brands. 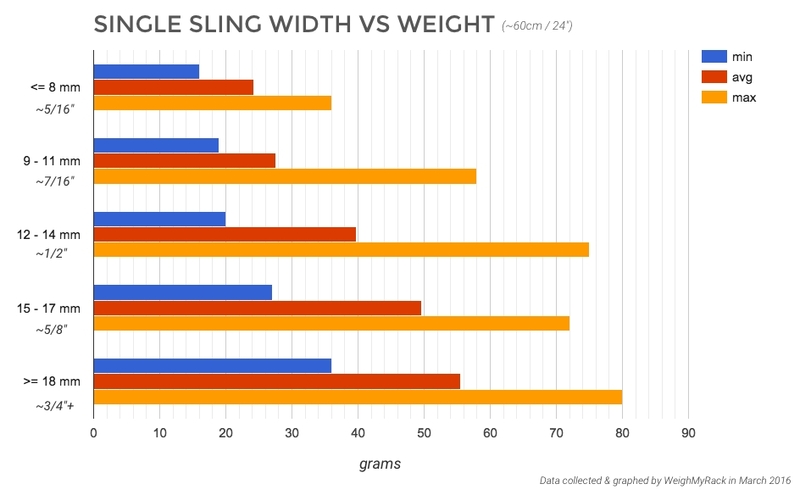 You don’t need a graph to know that a smaller width sling will weigh less (with a few exceptions), but how much difference does a few millimeters of material really make? For single slings (~60cm / 24″), the min weight is a scant 16 grams while the max weight is 80 grams. That’s a huge range, and makes the debate seem more black and white than it really is. If you’ve already decided on a sling width, surely the weight range is much smaller, right? We were surprised to see the max weight for the 5/8″ range lower than the max weight for the 1/2″ range. This is because of Mammut’s 80 cm slings (again, we are comparing all “single” slings which includes lengths from 50 cm to 80 cm). Turns out that Mammut’s 13 mm Crocodile Sling uses a slightly “fatter” webbing which is slightly heavier than their 16 mm Tubular Sling. Geeking out a little further, if you took 12 slings (of average weight for each given width) on a climb, the weight differences really start to add up. This table shows the +147.6 g weight jump moving from 7/16″ Dyneema slings to 1/2″ hybrid slings and another big jump of +117.6 g when moving to 5/8″ nylon slings. *Weight data was pulled in March 2016, and included widths and weights for 90 different single slings from 21 different brands with single slings between 50 cm and 80 cm. Our brains tell us that the skinnier the sling, the less weight it’ll hold, it’s an easy to understand pattern. Even when we know that, regardless of sling width, the sling certification test is exactly the same and all certified slings are rated to hold 22kN, that won’t necessarily stop your brain from telling you skinny slings are scary. If this is the case, the answer is simple: don’t buy slings 8 mm (5/16″) or narrower. There is no reason to be second guessing your gear instead of focusing on the climb. Climbers should be aware that all slings, whether skinny or fat, Dyneema/Spectra or Nylon, are susceptible to significant strength loss due to a girth hitch, and should use any connecting knots with caution. While there may be some additional strength loss when connecting skinnier slings, this additional loss is only a few percent (the equivalent of perhaps 250 lbs out of 5000)–the additional strength loss is not enough to treat today’s extremely thin slings any differently than fatter or nylon slings—all girth hitches must be treated with caution. The safest way to obtain a longer sling is to use a longer sling in the first place, rather than connecting them at all. If two slings must be joined, the strongest way to do so is with a carabiner. Knots in slings is a little off-topic for this post, and we mention it only as it relates to sling width. We dive into much more detail about knots and provide more links and references in our post explaining the difference between nylon, Dyneema, and polyester. We list 5 width ranges on WeighMyRack to filter slings. Here is the rule of thumb for each, considering the above information. This is the best option if weight is your top concern and you’re willing to pay a premium for the least weight. It’s also important that you don’t mind your slings looking incredibly skinny. The most common width of Dyneema / Spectra / Dynex slings. Overall these are the most reasonably priced if you’re leaning towards skinny slings with great handling and are willing to pay a slightly higher price but don’t want to break the bank. These slings offer the greatest balance between low price and low weight. You can still get a sling with Dyneema / Spectra / Dynex, but it’ll include up to 60% nylon or polyester which reduces the price (and increases the width). This is the value size. They’re a little heavier and bulkier than the narrower (Dyneema/Dynex/Spectra) options as they’re almost entirely made of nylon or polyester. These are great for anchors. They can still work for alpine slings, but they are a bit more cumbersome. If price is your primary concern and you like the look of beefy slings, and you’re willing to deal with the extra bulk, then these should be your slings of choice. 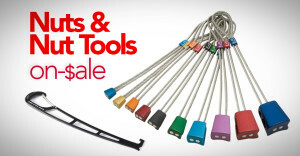 Really, they’re nice for anchors, but can be inconvenient and awkward for other uses. Another great article WMR: bringing it all together and making it plain. Reading some recent reports I’ve decided on this way of selecting a sling: Dynema for when its in a system with dynamic rope (runner) and nylon for anchors where impact force might come directly onto the sling (if you fell while connected direct to an anchor). Pretty much what you said above. Totally agree Tim! We kinda skim that topic on this post, but go over it in many more details on our Nylon vs Dyneema post. For hard red-point style sport climbing the fatter dogbones are a real benefit. They stop the quickdraw from spinning or becoming twisted when the wind blows and reduce the chance of fumbling a clip, as skinnier draws are more susceptible to inadvertently twisting if you do not grab them perfectly. The wide sling means you can grab them easily when you’re working a route which can be beneficial in getting up the route and working the moves. If you look at the quickdraws that are probably considered the gold-standard within this style of climbing, say the Petzl Spirit, then you’ll notice they have a really wide nylon dogbone. Same for the DMM Alpha QDs (my personal favourite) — their dogbone is 26mm wide. Just measured some Petzl Spirit draws that happen to be lying next to me and the slings are a good 24mm wide. Watch any video of a hard red-point and you’ll see this style of draw. The primary benefit of narrower slings is for the weight reduction which comes at the expense of handling. However when you’re climbing on-sight, or hauling a trad rack as well then obviously the advantage of less weight will be a much higher priority.